In the new space, the options are truly endless, and I love it! Fortunately I do have a few specific ideas for looks to attempt, so I'm able to proceed with a sense of purpose and direction. I want these videos to be soothing to watch, grounded, relatable, yet just a tad fanciful or dreamy. I'm also aiming to come as close as possible to showing every single step of every single build, which surprisingly is far from the standard. Early on I gathered a lot of feedback about tuning the speed of my builds, and was encouraged to compare my own work to that of the most popular build specialist channels, set for set. I discovered that I was using a much faster time multiplication factor, but creating nearly identical lengths of final, rendered footage. It seemed fundamentally impossible, but as it turns out, the only logical explanation is the correct one, that others constantly skip forward between cuts! I never would have thought of doing that myself, and it's an interesting and very sensible technique to be easy on the eyes & brain of the viewer while keeping video length in check. It's not a technique I'll be following, though. Since my earliest (terrible) speed builds in 2013, I've been showing the entire process from sealed box to finished set, and I'm going to stick to that, at least for the foreseeable future. My first build videos in Studio B utilized three different cameras, of different formats no less, to simultaneously capture different angles of the work. This introduced some visual variety compared to my previous tripod-based time lapses while also ensuring very little was missed. Fairly quickly I trimmed this down to just two cameras, one on a static mount up close and another able to be shifted around for wider alternate shots. In my most recent behind-the-scenes update, effected just one day before this writing, I've now switched to using a single camera (my best), while still retaining the ability to easily move the point of view as needed. 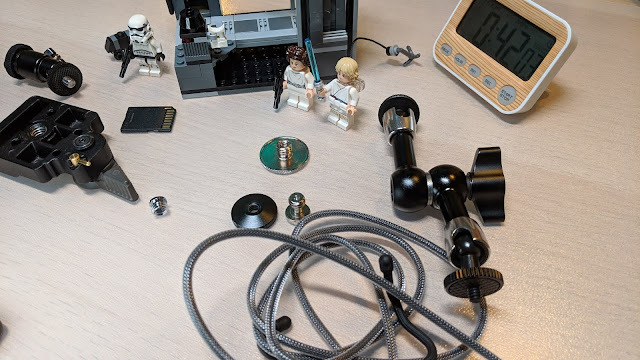 The Burger Bar Fire Rescue build was the first to take advantage of this more efficient setup, with the Death Star Escape video trying a couple more things to streamline the post-filming workflow (mostly successfully, with one change to roll back). Before I could even get that last set off the table, though, inspiration struck yet again and in an all too familiar pattern, out came the 1/4"-20 to 3/8" adapters, articulating arms, HDMI cables & adapters, mini ball heads and all manner of other useful hardware. It's upgrade time! Yeah, I am definitely addicted to this stuff. Thankfully it's all constructive, helps me be more productive, and improves the quality of the work that I publish. I can't hate on the fact that it's an enjoyable challenge, either. Very interesting that you went from three cameras to one. I guess simple is better. You have achieved Zen state of filming! Since watching your videos (yes, I watch pretty much all of them), I notice even more how sloppy other reviewers often are. Shaky, unfocused cameras, dim lights, weird angles... it's refreshing to watch someone who actually take quality seriously. You are certainly putting a lot of content out at the moment, I'm falling behind on watching but I'll catch up. The quality of your reviews is as high as ever. Keep up the great work. "1/4"-20 to 3/8" adapters, articulating arms, HDMI cables & adapters, mini ball heads and all manner of other useful hardware"...lol, that does sound like the lingo of a youtuber addict:) It's great to be immersed in a satisfying hobby/job. Your videos are excellent and I try to watch them all, even the Overwatch and Minecraft ones altho I'm not a gamer. 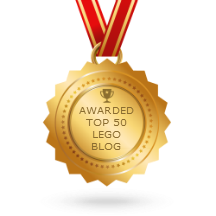 Your work is enjoyable to watch and I learn a lot about Lego from both the builds and the reviews. I'm a professional filmmaker and I love your videos. The formula is working...the formula in this case being, if you like it as a creator, your subscribers are gonna like it too. I love tot see how you keep improving your work and I love your videos. The have a nice Bob Ross effect on me. I do wish we'll get to see more of New Jang City. Content on that has been slow lately, and it is the reason I watch your channel. The reviews, I don't care for verry much. Time lapse is stress, pure stress. Lego is for me to relax, to switch off, to fall asleep. That's why the "Held der Steine" is the 1st choice for me. Relaxed building and he tells about God and the world. Your time-lapse makes me nervous and stressed.